The unique formula of the Micro Tek Equine shampoo stops skin problems now. The fastest-acting, most effective anti-itch shampoo ever developed. Effective on hot spots, seborrhea and ringworm. Trademarked formula developed from NASA research helps minimize fungal and bacterial skin conditions. Eliminates pet odor. Will not burn or irritate open wounds. Environmentally friendly and non-toxic. Is of course also safe for humans and has a pleasant fragrance. 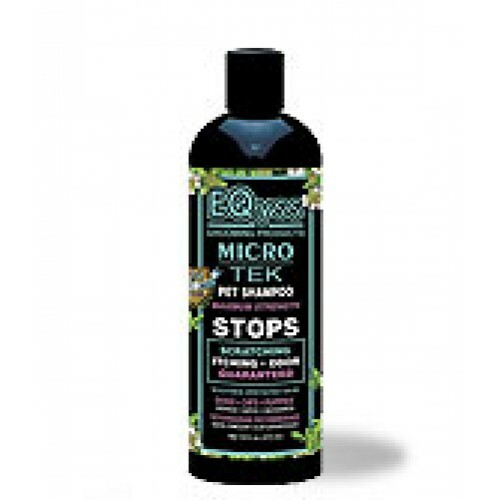 The fast-acting formula of Micro-Tek Pet Shampoo provides a healthy environment for healing, giving effective relief against a variety of skin conditions, including flea bites, ringworm,dermatitis, seborrhea, hot spots and dry itchy skin. It may also be used in the genital area and does not burn in wounds. The effective ingredient combination controls the dry, flaking skin conditions while eliminating pet odor at the same time. Developed from NASA research, it's antibacterial, antifungal and antimicrobial. Non-toxic, environmentally friendly. EQyss products are 100% CRUELTY FREE and are 100% SATISFACTION GUARANTEED. Every EQyss product is made with all natural, botanical ingredients wherever possible. None of our products contain DEA. MICRO-TEK shampoo leave on for 5 minutes, rinse well. For best results, treatment can be combined with MICRO-TEK spray spray on the affected areas of skin.